Car, SUV and 4x4, Light and Heavy Commercial Trucks, Agricultural, Forklift and Earthmover; we do it all. Our primary brands are Michelin, BF Goodrich, Falken, Maxxis, GT Radial and recently added, Mickey Thompson. We also have access to many more brands out there, check out our Tyres page for more information. We offer a range of wheels to suit the style you're looking for. From heavy duty, black and white steel wheels to light weight racing alloys. We offer a range of brands including; Advanti, Enkei, Niche, Dynamic, Mickey Thompson, DTM, Konig, Fuel, Cragar, BGW and much more. We have two state of the art alignment machines in store. John Bean V2200 3D aligner, accompanied by a long wheel base hoist to do Cars, SUVs, Utes and Campervans up to 6 tonne and 4.3m wheelbase. 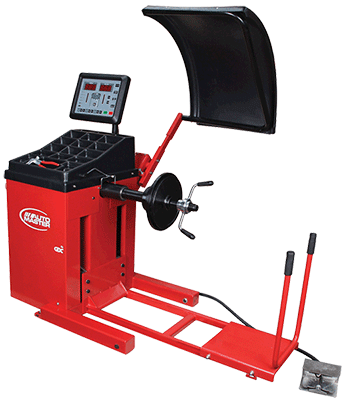 CEMB DWA1000W Truck aligner to do trucks, coaches and motorhomes up to 28 tonne and 5 axles. Car wheels; 10 to 24"
Maximum wheel width of 20"
We also offer Counteract Balancing Beads for truck wheels 15" to 24.5". Even though we are a local store to Rotorua, we are members of two service networks covering the entire country. Michelin Rapid Response is a 24/7 tyre breakdown service for truck operators nationwide. With Rapid Response service providers, including Advantage Tyres dealers, throughout New Zealand your fleet is in good hands anytime, anywhere! Ask your Advantage Tyres dealer for details on how to join the MICHELIN Rapid Response programme.